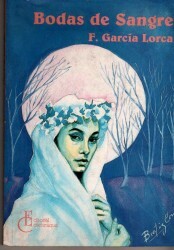 A member of Generation ’27, that is to say a member of the intellectual avant garde including filmmaker Luis Bunel, and painter Salvador Dali, Garcia Lorca was a renowed poet, folklorist, and musician who introduced symbolism, surrealism and futurism into the literature of his native Spain. At that time Spain was still feudal, repressively Catholic, which was not a nurturing place to be for a talented homosexual just before the outbreak of the Spanish civil war. During the Republic, he became a director, actor and toured the provinces taking free theatre to the masses. It was during this period that he wrote three plays lumped together as the Rural Triology: Blood Wedding, Yerma, and The House of Bernada Alba. All three deal with themes of repressed sexual passion, lack of personal choice, and questions of fate. Unfortunately, he was executed by Franco’s forces in 1936, so he did not leave a huge body of mature theatrical work, and like many homosexual writers before the Gay Liberation Movement, he tended to use women as mouthpieces for his repressed sexual passion. Blood Wedding takes place in rural Spain, involves a multi-generational violent feud, a sexually-charged love triangle, which all ends in tears. One big flaw in the script is that a male homosexual author transposes his sexuality onto a woman and does not deal with the social, economic or biological consequences of her situation. e.g.the innate fear of an unwanted pregnancy which was at the core of all women’s “sexual repression” before effective birth control. For reasons never made clear to me, the performance was in both English and Spanish which presented a huge problem to those of us whose Spanish is not particularly fluent, as some scenes were completely in Spanish. The English translation, by Caridad Svich, was full of not only stilted English but also incorrect English When spoken it sounded like it had been translated by someone who had learned English as a written language and had no idea what the spoken language was supposed to sound like. For example, none of the auxiliary verbs were contracted, so we heard endless sentences with “I will go” spoken casually. It seems that the translator and the director did not understand the different nuances of the statements “I will go” “I’m going” and “ I’ll go”. Also there was a lot of just plain bad English, such as “ There are many” instead of “There are a lot” The stilted language engendered stilted acting and the timing was off. Only one actor, the father of the bride, Michael Blum seemed make the lines his own. Whole scenes with plot points and heavy emotional information were in Spanish so a lot of the audience was lost, but when it would have been appropriate to use Spanish terms of address and endearment, they were translated into English, making it sound wretched. For example, a would-be mother-in-law addresses the bride-to-be as “child” several times in English, when she it would have sounded better for her to just speak in English and slip in “nina”. There was some delightful Spanish music, some good dancing and a stylized fight scene influenced by flamenco which showed some creativity, but I think this theatre needs to go back and rethink its mission. There are plenty of people in this city learning Spanish, who would come to a Spanish-language production of this play-try high school and college students, likewise plenty of people who would come to a production in English with a few Spanish words thrown in, if there were a decent translation, not one which sounded neither poetic, nor realistic, nor colloquial. Predictably, the actors did do better with the original text, so if you can sit through the mangled English, I would go see this production.